"How do you stay so organized? Keep track of all your inquiries and clients? Make invoices and contracts and keep track of your income?" I get asked this question frequently, so I finally decided to go ahead and write a blog post about it so that anyone who stumbles upon this might be able to benefit from it! For years photography was always a hobby for me. Collecting payment from my clients was merely accepting a check from them the day of their photo session then depositing it into my personal account. All under the table, very unofficial. Of course when I decided to go full time a year ago and make this my only source of income, I knew it was time to put my big girl pants on and get to work. I did some digging and stumbled upon this amazing site called 17hats. I decided to sign up for the 1 month free trial to give it a go. Some people have told me it's too overwhelming or they don't have the time to figure it all out, but really it is super simple to get everything set up and figured out if you give yourself a few hours! I entered in all my business info, uploaded my logo, and then checked out my dashboard. Upon logging into 17hats, your dashboard will show you a nice view of what's on the calendar in the next few days (including weather reports! ), emails you need to reply to, to do items, pending invoices and contracts, and recent client activity. I love this client activity feature because it allows me to track when clients have viewed the emails I've sent them. This comes in handy when I realize that I missed a letter in their email and so that invoice and contract I sent 2 weeks ago? There's a reason they haven't seen it- it never went through! When a client contacts me to book a session, I get their address, phone number, and email and create a "lead." From there, once the client has made the decision to move forward in the booking process, I move them to the client section and create a new "project." Once a client has confirmed they want to book, I create an invoice for their sitting fee. I love the template feature on 17hats for everything! I literally press 2 buttons and all the info is ready to go on the invoice- The session fee, the description of what's included, the price, etc. The client's info and my info is all on there so they can easily know where to send me a check should they choose to. And when they pay online, I have my bank account hooked up to square, so the money is deposited straight into my account within a couple days! After I've created my invoice and sent it over, I create a contract. Again, the template system is great! I have different templates depending on the session type, so I just insert whichever session it is, and everything is ready to go! Since I already got my client's info out of the gates, I inserted buttons in the template that automatically fill in that client's inf in the places it needs to go. So simple and so quick! They just sign their name online and you get notified when they've done so. Another reason I love the template system is that it sends out automatic reminders that I don't have to worry about. For invoices, an email is sent the day before it is due and then if it is past due. This way I don't have to track and down and remind clients when they have payments coming up! Of course there are tons of other features that can be used and explored on this program. I've been using it for a year now so my system is pretty set in stone, but everyone will vary! 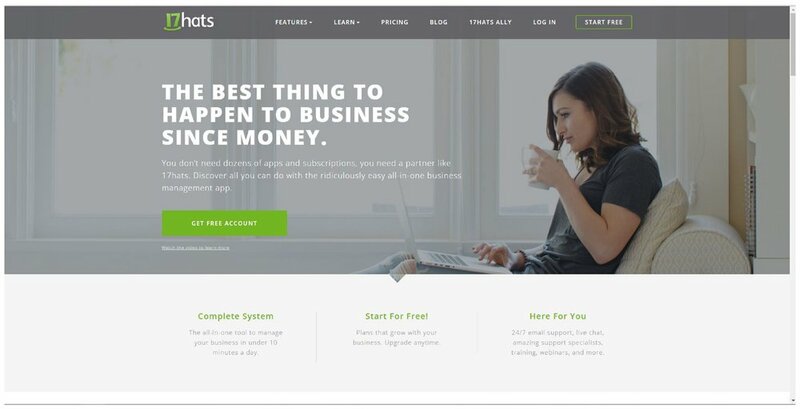 There are so many features you can choose to use (or not use) so that any business owner can utilize this site in the way that best suites them. When it comes to owning your own business, especially one where it is just YOU, there are only 24 hours in a day that you can get things done. 17hats literally has changed my life so that I can spend way less time dealing with making contracts and collecting payment and more time shooting, spending time with loved ones, working on marketing, and- you guessed it- blogging! I strongly urge you to give this program a try if you feel like you are lost or can't keep up. I love being able to keep track of all my clients, what steps of the booking process we are in, how much I'm spending each year on my business, utilities, equipment, etc, and having all the info in a place that is super easy to collect and hand to my accountant. Feel free to leave any questions you may have in the comments below. We are all a team here!